It was inevitable. As calls increased by U.S. Secretary of State John Kerry and NATO military commander General Philip Breedlove, among others, for lethal military equipment to be shipped by the United States to the putschist regime of Ukraine, a flurry of Ukrainian cargo transports landing at military supply airports in the United States and Europe hearkened back to the days when non-descript transports plied the world’s air routes clandestinely and simultaneously delivering weapons to Iran and Nicaraguan rebel forces. In a repeat of the Central Intelligence Agency's globe hopping weapons transport cargo planes of the Iran-Contra scandal era and the more recent Libyan rebel supply caper to overthrow Muammar Qaddafi, a Ukrainian Antonov AN-124 (tail number UR-82072) heavy lifter military transport plane, denoted as an «International Cargo Transport» and belonging to the «Antonov Transport Bureau», astonished residents around Belgrade's Nikola Tesla International Airport in Serbia when it landed there on January 28, 2015. The Ukrainian plane, the world's largest aircraft, was a rare sight at an airport in a country that generally supports Russia in its conflict with Kiev. Kerry and Breedlove are talking about commencing an arms shipment by NATO that actually began last year. In September 2014, Ukrainian President Petro Poroshenko stated that a number of NATO countries agreed to deliver weapons to Ukrainian forces, which consist not only of regular Ukrainian troops but irregular battalions supported by billionaire Ukrainian-Israeli warlord Ihor Kolomoisky consisting of neo-Nazis, U.S. and other private military forces, and ex-Israel Defense Force personnel. At the time of the September 2014 NATO summit in Wales, Ukrainian presidential adviser Yuri Lutsenko said that the United States, France, Poland, Norway and Italy had agreed to supply weapons to Ukraine and Canada later revealed that it had also commenced weapons transfers to the Kiev putschists. Ukraine's military forces have received so much NATO military aid and assistance and personnel, Russian President Vladimir Putin recently said that the Ukrainian Army is acting as NATO's «foreign legion.» There are also credible reports that NATO has supplied the Kiev regime with deadly cluster bombs that are being used against the largely Russian-speaking civilian population of the Donbass region of eastern Ukraine. The AN-124 that landed in Belgrade appears to have been ferrying weapons from a number of known NATO air terminals used for such purposes. After arriving in Bucharest, Romania on January 23, 2015 from the Italian island of Lampedusa, off the coast of Libya, the aircraft departed on January 23 for New Jersey in the United States. Lampedusa was a major staging base for NATO weapons supplies to Libyan rebels during the Western- and Islamist-inspired rebellion against the Qaddafi government. Bucharest has become a major base for NATO military support to Kiev. On January 25, the Antonov departed Newark Liberty International Airport, New Jersey for Trondheim, Norway. On January 26, the Ukrainian transport plane left Trondheim for Prestwick Airport, Glasgow, Scotland. The plane departed Prestwick on January 28 and touched down the same day at Belgrade. Prestwick was a favorite transit hub used by the CIA for the rendition of detainees following 9/11. The United States has positioned six storage units located in the mountains of Norway’s central Trøndelag region, the capital of which is Trondheim. U.S. military equipment, including tanks and armored personnel vehicles, are stored at two Norwegian Air Force stations in the area, one of them being co-located with Trondheim Airport Værnes where the Ukrainian Antonov landed on January 26, 2015. The Antonov's destination after it left Belgrade was Mombasa, Kenya via Athens. The plane was reported by Serbian sources to be carrying «special cargo» weapons. It is conceivable that UR-82072 dropped off in Athens for further shipment to Ukraine weapons loaded at NATO airports in Lampedusa, Glasgow, and Trondheim, as well as Serbian caches placed on board in Belgrade and, perhaps, U.S. weapons stored at Picatinny Arsenal in Morris County, New Jersey, the Defense Department's Specialty Site for Guns and Ammunition, and Naval Weapons Station Earle, New Jersey. Both weapons bases are in close proximity to Newark Liberty International. The AN-124 is permanently based at Kiev's Gostomel Airport. The plane’s visit to Newark airport was said to be “rare” by local plane spotters. Ever since fighting broke out between Ukrainian forces and Russian-speaking separatists in eastern Ukraine, the mysterious Ukrainian AN-124 has been spotted around the world, likely picking up weapons. On June 18, 2014, it was seen at Tel Aviv's Ben Gurion International Airport. Before that, it was seen on May 22, 2014 at Las Palmas, Canary Islands, in what may have been a refueling stop. On January 1 and 6, 2015 and November 23, 2014, it was spotted at Leipzig/Halle Airport in Germany; on July 2, 2014, it was Luqa International in Malta (Malta was another staging base for weapons supplies to anti-Qaddafi forces during the Libyan civil war); and on April 15, 2014 at Francisco Sa Carneiro Aiport, Porto, Portugal and a week later, on April 27, at Schwechat Airport in Vienna. In June 2014, the Ukrainian transport plane was at Boston Logan Airport, Tulsa International in Oklahoma (the home of Tinker Air Force Base, a major logistics center), and Philadelphia International Airport (near Boeing’s Rotorcraft Systems in Ridley Park, Pennsylvania). The Ukrainian plane was reported to have arrived from Ben Gurion in Tel Aviv to pick up an Agusta Westland ICH-47F Chinook helicopter, licensed by Boeing, for the Italian army. However, it is anyone’s guess what the Ukrainian plane picked up in addition to the Italy-bound Chinook and where such “extra cargo” may have ended up. On May 14, 2014, the Ukrainian Antonov was seen at Calgary International Airport in Alberta. Calgary is a major nexus for the Canadian and American military-industrial complex, hosting Raytheon Canada’s missile production division and plants producing the rotary Phalanx machine gun and infrared and targeting equipment for armored vehicles, and General Dynamics, Harris Corporation, and NovAtel factories manufacturing everything from avionics systems to satellite communications gear. Also in June 2014, the globe-hopping Ukrainian weapons transport was seen at Ted Stevens International Airport in Anchorage, Alaska. In June 2014 it was seen in Buenos Aires. In October 2013, just a month before the outbreak of CIA and State Department-supported Maidan protests in Kiev, UR-82072 was seen on the runway at Dulles International Airport, which sits in the middle of an American military-intelligence industrial complex that includes the CIA, Defense Logistics Agency operations, and major war contractors like Boeing and Lockheed Martin. Dulles also hosts a German military base on American soil. 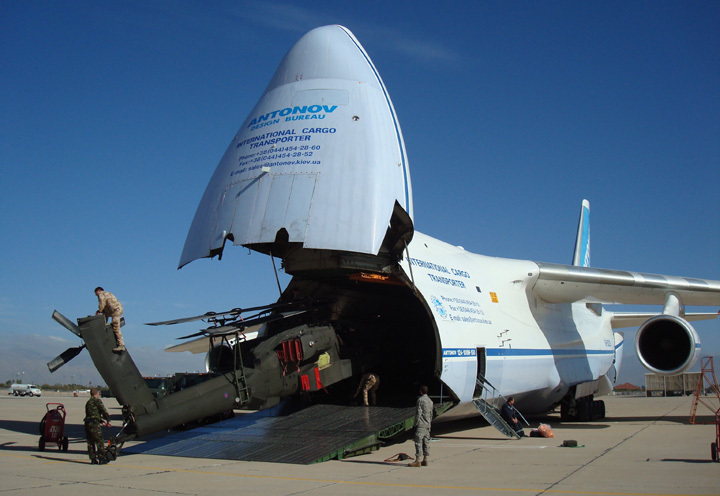 On April 4, 2014, the Antonov weapons carrier was sighted at Portsmouth International Airport, the old Pease Air Force Base, which is now a New Hampshire Air National Guard Base. It is said to have departed for Dakar, Senegal. However, one of the most common tactics of the CIA and U.S. military during the heyday of Iran-contra was to file false flight plans and bogus bills of lading. Israel’s Mossad assisted in the clandestine shipment of U.S. weapons, such as the TOW anti-tank missile, to Iran. There is little doubt that Breedlove, an unapologetic Cold Warrior, had previously authorized the transfer of NATO weapons to Ukraine via Tbilisi. Georgia and Ukraine have formed an “aspirant NATO member alliance” against Russia on a front line extending from South Ossetia, through Abkhazia, through eastern Ukraine and Crimea, to the Transnistrian Republic north of Moldova. It is this front line that NATO war planners now dream of directly confronting indigenous and Russian troops protecting the independence of the phalanx of states of South Ossetia, Abkhazia, Donetsk, Lugansk, and Transnistria but also Russia’s southern flank, including the Russian autonomous republic of Crimea and the Russian federal city of Sevastopol. It is clear from the arrivals and departures of Ukraine’s gigantic weapons hauler, Breedlove’s comments about arming Ukraine with lethal weapons were ex post facto. Once again, America has chosen a foolhardy strategy of war over diplomacy. And, once again, it will pay a terrible price in terms of blood and treasure.